Despite yesterday's promise with our Hot Deals for Cold Days that Spring is just around the corner, it looks like we're gonna be having some definite winter conditions at least for the next week. So, this is a perfect opportunity to tell you about another one of my favorite pieces of cold-weather cycling gear, the handlebar mittens. Handlebar mittens, also known as "pogies," are large glove-like devices that wrap around the grips on your handlebars to block the wind and keep your hands warm. 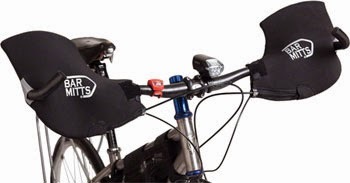 They are large enough to wrap around your shifters and brake levers, with enough room inside to operate your bike controls without removing your hands. We had a couple of the "Cobrafist" pogies from 45North, and at $129.99 per pair, are the Cadillac model of handlebar mittens. Unfortunately, those are sold out for the season! 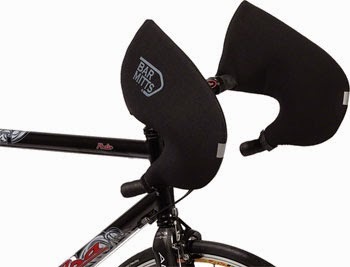 However, in our Winter Cycling Wonderland in Peninsula, we have a few of the Bar Mitts Pogies in stock. 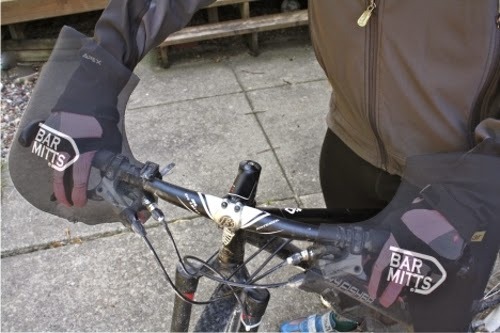 Bar Mitts is one of the pioneers of the handlebar mitten concept. Their models are reasonably priced at $79.99 per pair. 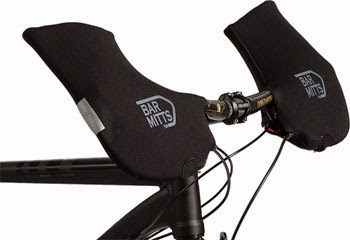 Bar Mitts come in several styles to fit road bikes with various cable configurations, and mountain/hybrid handlebars with and without bar ends. Bar Mitts Road Pogie Handlebar Mittens - Size: Large, for drop handlebars where all the cables (brake & shifter) are hidden under the handlebar tape. Bar Mitts Mountain/Commuter Pogies Handlebar Mittens - Size: Large, for mountain/hybrid handlebars WITHOUT bar ends. Bar Mitts Mountain/Commuter Pogies Handlebar Mittens - Size: Small, for mountain/hybrid handlebars WITH bar ends. As always, if you like to check out any of these items in another one of our stores, just give us a call, and we'll send it them to Medina or Rocky River at no extra cost or obligation. We can special-order other sizes and styles for you. 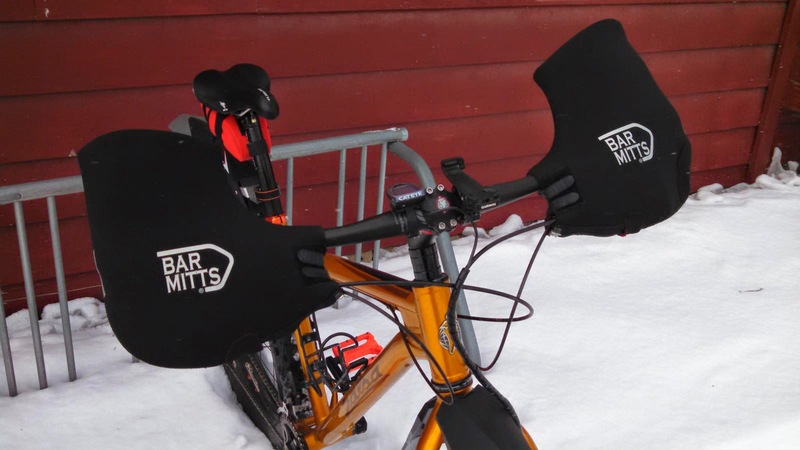 I've been using a pair of the Large Mountain/Commuter Bar Mitts on my Salsa snow bike for riding in the winter for the past year now. I have to say that I am pretty impressed with the warmth and protection they provide. I have ridden when the temperatures are in the single digits, and the Bar Mitts with just thin wool liner gloves on my hands together have kept my fingers nice and toasty.